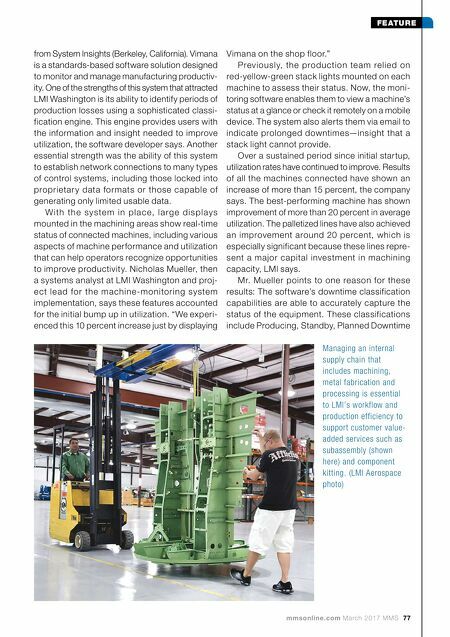 76 MMS March 2017 mmsonline.com FEATURE LMI's overall machining capabilities range from simple, two-axis turning to complex, simultaneous five-axis milling. Regardless of the type of machine tool involved, the company says it focuses on the latest tooling technology, cutting techniques and machining processes. High-speed machining l i n e s w i t h p a l l e t s y s t e m s , r o b o t i c s , l e a n manufacturing techniques and computerized inspection are implemented throughout its man- ufacturing facilities. LMI keenly understands the impor tance of reliable, streamlined and on-time part production because these are essential to the variet y of aerospace kitting services it offers to customers. Assembling kits in house helps facilitate the flow of components to the customer's assembly line, enabling those customers to keep inventory low and save floor space. While all of its operations reflect the policies and philosophies of LMI Aerospace, each facility has considerable autonomy and the responsibil- ity to pioneer applications of technology that best support its contribution to the corporate mission. A good example of this is LMI Washington's early adoption of machine monitoring and the data analytics that it provides. Other LMI plants have also begun testing and implementing networks for machine monitoring. These facilities expect to experience similar benefits. 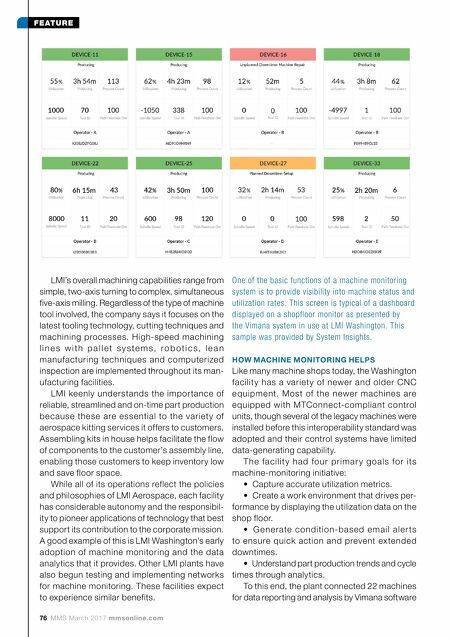 HOW MACHINE MONITORING HELPS Like many machine shops today, the Washington facility has a variety of newer and older CNC equipment. Most of the newer machines are equipped with MTConnect-compliant control units, though several of the legacy machines were installed before this interoperability standard was adopted and their control systems have limited data-generating capability. T he facilit y had four pr ima r y goals for its machine-monitoring initiative: • Capture accurate utilization metrics. • Create a work environment that drives per- formance by displaying the utilization data on the shop floor. • G e ne rate condition-base d e mail ale r ts to ensure quick action and prevent ex tended downtimes. • Understand part production trends and cycle times through analytics. To this end, the plant connected 22 machines for data reporting and analysis by Vimana software One of the basic functions of a machine monitoring system is to provide visibility into machine status and utilization rates. This screen is typical of a dashboard displayed on a shopfloor monitor as presented by the Vimana system in use at LMI Washington. This sample was provided by System Insights.